Alyssa Cassidy joined the lab in 2018, working with graduate student Nicole Berry on the effects of UV radiation on mosquito larvae. She spent the summer at the Lacawac Sanctuary and Biological Field Station assisting with experiments and routine sampling as part of a long-term research grant. Kali McKnight joined the lab in 2018, working with Master’s student Keiko Wilkins. Kali’s research focuses on the sensitivity of Holopedium to UV radiation. These zooplankton typically aren’t found in clear lakes. She seeks to understand if this observation could be due to their inability to survive in the higher UV environment found in more transparent waters. Will Swales, a geology major, joined the lab in 2018, working as a Student Aide. He provides invaluable assistance to the lab by counting zooplankton samples, adding to a zooplankton database that spans 30 years. Will spent his first summer at Lacawac Sanctuary and Biological Field Station assisting with experiments and routine sampling. Donna Nguyen received both a DUOS (Doctoral Undergraduate Opportunity Scholarships) and a USS award to investigate the changes in water column temperature and oxygen during the winter in two of our long-term study lakes. She works closely with PhD student Rachel Pilla to develop models to estimate periods of ice cover. Donna was also awarded a scholarship to attend the Grace Hopper Celebration, the world’s largest gathering of women technologists. Alessia Saul (standing) received a USS award to help implement a citizen science program for lakes in the Pocono region of Pennsylvania. PLEON, or the Pocono Lake Ecological Observatory Network, focuses on water quality education. Alessia designed PLEON’s logo and web site. She also created an informational brochure, assisted with public presentations, and sampled lakes to better inform lake associations of their local water quality. While conducting research on Daphnia surface avoidance one summer, sophomore Matt Meeks observed an event where large numbers of Daphnia infected with a Saprolegnia fungus died at the surface of Lake Giles. Since parasites have shown a sensitivity to UV, Matt set out to explore the UV sensitivity of other aquatic parasites including Pastueria and Saprolegnia. He and his PhD mentor, were awarded a DUOS to conduct this study. Cody Green earned a USS award for summer 2009. Cody’s research focused on reconstructing historic DOC patterns in Emerald Lake using sediment cores. 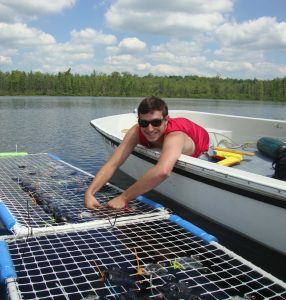 He coupled patterns from the field with analyses using advanced instrumentation in the lab to contribute to a broader research question- how do changes in climate affect the diatom and zooplankton communities of alpine lakes?